Microsoft has released browser that enables you to save your time and to access the tasks much more faster than you normally do. The browser called (Internet Explorer 9) , you can do the above by using a list of keyboard shortcuts for Internet Explorer 9 . Ctrl+Shift+L – If you have a URL in your clipboard, this shortcut loads it; if you have a text string in your clipboard, it searches your default search engine for it. By using Internet Explorer 9 keyboard shortcuts you can save time. Sometimes your computer's system may be slow and the performance of the computer may not be as you want, but there is feature in windows 7 calld "ReadyBoost", you can use this feature to speed up your system when you have USB flash drive. how does a USB Flash Drive Speed Up Your System? 1. Put your USB Flash Drive in USB slot on your computer and you will see an autoplay popup as picture below. Choose to “Speed up my system using Windows Readyboost”. 2. If you don't see autoplay popup, go to "My Computer," you will see Removable Disk "USB Flash Drive," right click on your USB and select "Properties." 3. In the Properties window, go to ReadyBoost Tab. 4. Select the option to “Use this device,” and set the amount of space you want to be used in increasing your system’s speed and then click to “Apply,” you can select "Dedicate this device to ReadyBoost." Windows will then create what is called a paging file on the disk which allows faster access. Note, this only works with SD cards and USB 2.0 devices. Now your system can work faster. 1. Click on Windows 7 Start and click Control Panel. 2. Type Advanced in the search box. 3. Click on View advanced system settings in the search results. 4. 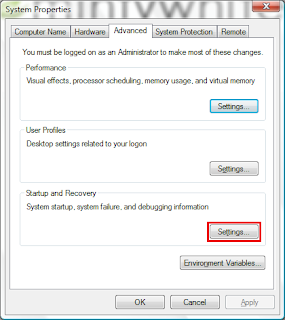 Under Startup and Recovery, click Settings. 5. In the Write debugging information drop down, click (none) and press OK. Note: You can disable memory dump files and save HDD space in windows 7 by Clicking on My Computer and click “Properties” [or] Windows + Pause/Break. Select the “Advanced Tab” and click on Setting under Startup and Recovery tab and follow the steps number 4 + 5. 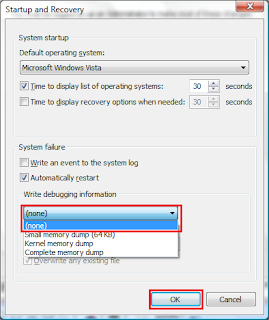 If you follow this steps you will Disable Memory Dump Files And Save HDD Space in windows 7. One of the easiest ways to allow customers to purchase an item from your site is to simply place a PayPal payment badge ( a PayPal donation Button ) on your site, linking to the PayPal payment page (the link is quite complex, because it passes quite a bit of information). The users complete the purchase by either entering their user information like credit card information (a PayPal account is not required). Once the transaction is complete, PayPal will notify you of the transaction via its Instant Payment Notification system. 1. Login to your PayPal account and select the Merchant Tools tab. 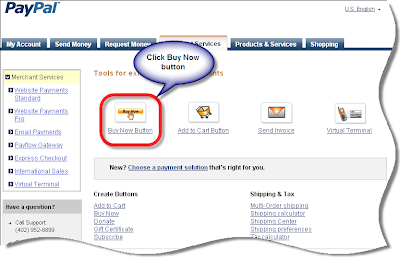 From within that tab, select the Buy Now Buttons link under the Accepting Website Payments. 2. Then choose the button style that you wish to appear on your site. 3. If you want you can specific a donation amount by filling the Donation Amount. 4. Under “Choose a donation button to put on your website (optional)“, you can choose a donation button or use your own image. 5. Finally select the default button. 7. Copy the HTML code for the donation button and paste into your website. 1. Internet Explorer: Right-click the image, click Save Picture As, choose a location, edit the file name, and then click Save. 2. Firefox: Right-click the image, click Save picture As, choose a location, edit the file name, and then click Save. 3. Safari: Right-click the image, click Save picture As, choose a location, edit the file name, and then click Save. Ok after download the image ( a twitter badge ) tou your computer, upload the image ( a twitter badge ) to you web site by using FTP. If your Web host provides you with an online editor, use an online editor to insert your a twitter badge. You can do that by Open the page in the editor, place the cursor where you want the image ( A twitter badge ) to appear, click the editor’s image tool, and then choose the Twitter badge file. Click the image to select it, click the editor’s link tool, and then specify the address http://twitter.com/yourname, where yourname is your Twitter username. Google Book Search is a large online warehouse of books. 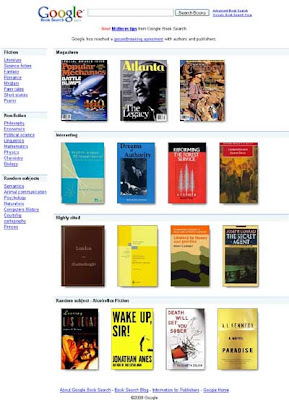 You can search any book you want and google book search will search within the book and return you the results. You can then see a preview of the book and read it. But the problem that you can't download books from google books, so i find a trick will allow you to download books (ebooks) for free from Google Books. 2. Type this address in Internet Explorer books.google.com and search the book that you want to download it. 3. Navigate to C:\Documents and Settings\% admin name%\Local Settings\Temporary Internet Files and delete everything found in this folder. 4. Refresh the page on Internet Explorer and browse the pages of the book that you want to download. 5. Now navigate to Temporary Internet Files folder and refresh it. 6. You will find many files end with .PNG these files are the pages of the book that you were browsing. Make a Copy for files end with .PNG and move it to an another folder. Now You can read the full books by using those images. The most easiest method to get good quality backlinks to our blogs is to leave comments on dofollow blogs related to our topic or niche. In this tutorial i will learn you how to get dofollow blogs related to our topic or niche. By doing this you will get thousands quality backlinks to our blogs, increase your page rank and some traffic if your comments are useful not spam comments. 1. Install SeoQuake plugin for Firefox from seoquake. 2. Install NoDoFollow plugin from mozilla. 3. Type “blogspot.com” in google search. As you see there are several pagerank 4 and 6 and i even found several pagerank 7 blogs. All you need to do choose a high pagerank blog and extract all pages and see their pagerank, so you can comment directly on the high pagerank pages. You can use a tool like pagerank spider to easy see internal pages PR. And want to login multiple accounts using Gtalk on single PC? 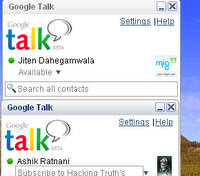 I found the way to run multiple Google Talk accounts simultaneously with a very easy hack. 1. First, create one copy of the Google Talk shortcut on your desktop. To creat a Gtalk shortcut on your desktop, Right click on your desktop >> New >> Shortcut. Type “c:\program files\google\google talk\googletalk.exe” /nomutex in the shortcut field, and it will automatically make an multi login Gtalk username for you. You will now be able to run multiple instances of Google Talk with different identities for each. Now you can make free international calls to over 40 countries. Tuitalk offers about 18 minutes of free calls each day (trick being to register with your extended profile). Tuitalk like Jajah, Jajah lets you make free calls using the Internet without headphones, microphones or having to install any software. Each day Tuitalk gives its users 18 minutes of free calls. you can make free calls to israel worth 18 minutes every day. Your account is automatically credited with 18 minutes every day. 1. Register at Tuitalk and download tuitalk voip softphone or download by click here password (winrar): tuitalker. 2. Activate your account and fill your extended profile. 3. Login into tuitalk voip softphone. 4. To make calls to israel dial (country code + number) like 00972xxxxxxx. 5. You will be see a small advertisement, then your call will be connected. Last hours ago i wrote a post on convert PDF files to word online free but in this post you will learn how to convert files such as Word, Excel... to Pdf by using PDFCreator. PDFCreator is a tool to help users convert files into PDF format, and comes at no cost. Use it like a printer in Word, StarCalc or any other Windows application. Simply open your file, such as a Word document, and click File > Print. Select the PDF-Creator printer and you're done. AVG Free Edition is the well-known antivirus protection tool and one of the most popular anti-virus packages on the planet . AVG Free is available free of charge to home users for the life of the product and it is used by 80 million users in over 150 countries. AVG Free is easy to use and will not slow your system down (low system resource requirements. Highlights include automatic updates on a daily basis via its Update Manager Component, the AVG Resident Shield, which provides real-time protection as files are opened and programs are run, LinkScanner® Active Surf-Shield checks web pages for threats at the only time that matters – when you're about to click that link. free Virus Database Updates for the lifetime of the product, and AVG Virus Vault for safe handling of infected files. You can download avg antivirus by click here.